I've mentioned in the past how much love I have for LeChat Dare To Wear shades. The formulas are always great and the wear time is unparalleled. They wear like iron, no joke! I recently spotted a new collection at my local beauty supple, Belle La Vie. If you're familiar with LeChat polishes, you'll note that these are new bottles! I quite liked the old bottles with the matte rubbery handles but these look nice too. I picked up three of the cremes, perfect as base colors for layered manicures or nail art. Now there are six shades total and each shade is also available in Perfect Match Gel. The three shades I picked were On Cloud 9, Just Breathe and Utaupia. On Cloud 9. Two coats. An off white creme, dusty and slightly dove grey. Just Breathe. Three coats. A putty-like light off white creme. Utaupia. Two coats. A soft taupe, the color of a bruise on a mushroom. All three had nice buttery formulas that flowed nicely. These colors are soft, dusty and dainty shades that are perfectly workplace appropriate. 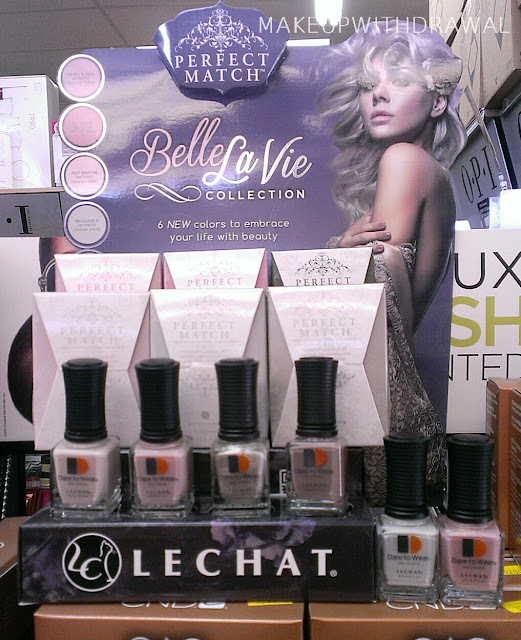 Once again, I must state that I think LeChat is one of the must underrated mainstream polish brands!